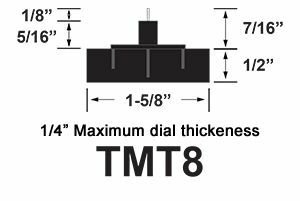 Click here for 7 7/8"
Our thermometer movement is the best quality on the market today. It is an accurate, durable movement, and it’s easy to calibrate. It operates battery free on an accurate Bi-Metalic coil. This metal coil has two metals bonded together. They expand and contract at different rates during any changes in temperature. These temperature changes cause to coil to twist, turning the indicator hand at a very measurable rate. You can use it indoors or outdoors. It’s very reliable. Once you have installed the thermometer movement, locate the thermometer next to another one in your home, and leave it there for an hour or so. When you come back, simply press the indicator hand on in the exact same position as the other thermometer reads. Pretty simple! That’s all you had to do to "calibrate" your new thermometer movement. The "scale" this thermometer works with has "0" degrees at the 9:00 position and "90" degrees at the 3:00 position. Please see our thermometer dials below for reference. If you have a much different scale on your thermometer, then our movement may not read accurately in your case. 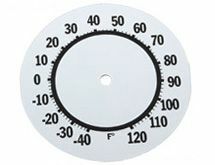 This round thermometer movement is held in place by a washer and hex nut tightened to the threaded shaft on the movement. A good double faced adhesive tape could also be used. Choose from the 3 indicator hands shown below. All indicators can easily be trimmed to a shorter length. For Indoor/outdoor use.